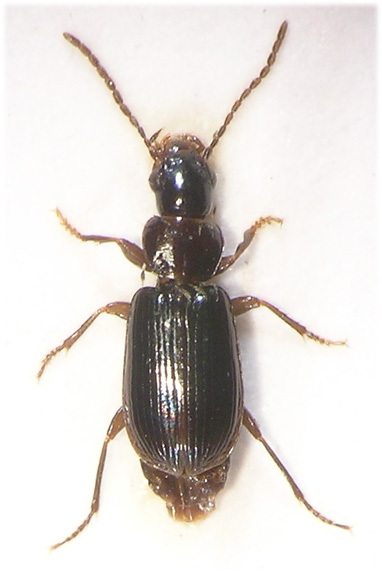 A very local ground beetle; with only a few exceptions modern records are confined to southern England between the Wash and the Severn estuary; from the west country there are a few older records (pre 1980) from north Devon, north Cornwall and Landsend. The only island records are from Scilly (pre 1950). Further north there are a few older records from eastern Yorkshire and one from Cumbria (Carlisle pre 1950). The species inclusion on our Watford list is from a single specimen found on Common moor during April 2007; interestingly, from our point of view, there is a pre 1950 record from southwest Herts (NBN Aug 2009) which might suggest a long term population. Typical inland habitat is shaded marshy areas on clay soils; our specimen was extracted from a deep moss sample taken from the top of a willow log lying on waterlogged silty soil among emergent vegetation. The species also occurs in slatmarshes and among coastal debris. Adults are thought to breed in early spring and occur for only a brief season between March and May (Luff), this may explain why we have only a single record; this part of the moor is, most years, either flooded or waterlogged well into May and difficult to sample. 2.2-2.8mm (Lindroth, 1974) A tiny and rather flat carabid, overall appearance dark; body black or dark brown, pronotum and elytral suture sometimes a little lighter. Legs and antennae brown, in our specimen the protarsi are pale. Head black or nearly so with mouthparts lighter, eyes proportionslly small, temples parallel, surface with fine and obscurely transverse microsculpture, just visible at X40. With a single setiferous puncture beside each eye and without any impressed lines between basoclypeal suture. Apical segment of maxillary palps long and slender, very narrow in apical third. Antennae dark, at least from second segment, densely pubescent from third segment. Pronotum transverse (11:15) and broadest in front of middle, strongly bordered laterally but not along anterior or posterior margins. Lateral margin straight in basal half, hind angles rounded. Basal fovea shallow and ill-defined, basal puncturation confined to a few punctures. Scutellum microsculptured; obvious at X40 and contrasting against the surrounding elytra. Elytra glabrous and shiny, scutellar stria well developed and all striae complete to apex. Interstices flat or a little convex towards apex, third with a small pore, usually adjacent to the second stria, in the apical third. Apex rounded but with a weak sinuation before suture. Legs long and slender, fore tibiae deeply notched inside before apex, all tibiae with a single apical spur. Claws smooth.